Four million YouTube views later and not a dollar paid for TV airtime, this ad could not be more loved. Chipotle comes out well, and looking good. I'm a little curious about it still. Chipotle has more than 1500 storefronts and made $800 million in revenue last year. 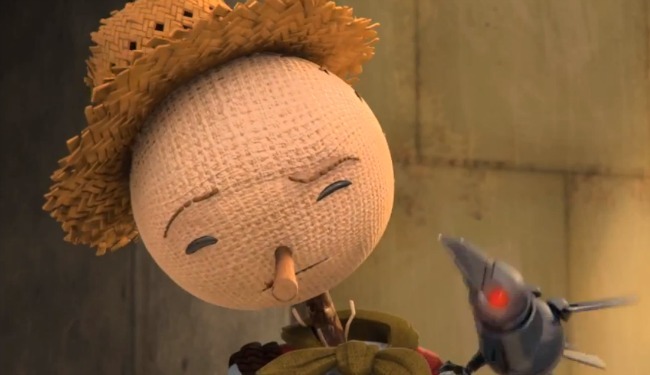 For one, the scarecrow, when confronted with the financial obstacles to farm-to-table business models, will find it hard to compete with companies like Chipotle. I mean only to raise this question, but what is Chipotle claiming about itself here? The company has traditionally, and continues to, espouse Food With Integrity. It advertises "naturally-raised" meat, though the definition of that is nebulous. Chipotle does still try to avoid antibiotic-raised food animals, but not always; and they do employ at least some industrialized farming. The ad also implies that their food is local, but Chipotle's actual position is, "It's not possible or practical for us to source all of our ingredients locally [defined as within 350 miles]. Still, we believe it's important to do as much as we can." Finally, the drone-crow saw the scarecrow selling his fresh tacos, and that can't be good. That crow seems like he's going to report back to his giant crow bosses. And then, oh boy. The best thing about all of this is the news that Fiona Apple is alive and well. When you use her to manipulate our emotions, though, Chipotle—singing from Willy Wonka & The Chocolate Factory, no less—I hope you're doing everything possible to meet the standards implied here.